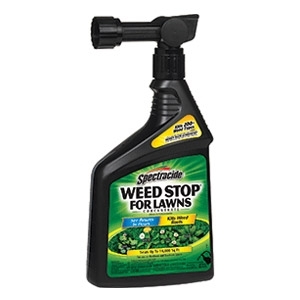 Enjoy a beautiful lawn with the Spectracide Weed Stop For Lawns Concentrate (Ready-to-Spray). It kills tough weeds, and it delivers results in just hours. Use it on most lawn types, including Bermuda Grass, Bent Grass, Centipede Grass, Bluegrass, Fescue and Zoysia Grass. If certain tough weeds are not dead within three weeks, repeat treatment. Use of this product when air temperatures are above 85°F may result in lawn damage. Do not water within six hours of treatment. Poor weed control may result if rainfall occurs within six hours of application. For best results, mow lawn before treating weeds.